First you write. And then you rewrite and rewrite. Rewrite, query, reject and so forth. Multiple times. Agent Edward Necarsulmer wants more! Ding, ding, ding! FSG buys it on first round of submissions! hard copy AND an ebook. Random House's Listening Library buys the rights to do an audio book. Then there's the waiting for two years for an actual BOOK to be produced, high expectations, more writing, then marketing-induced psychosis. For realz. You make a God box and keep putting the book in there. It's the only real thing you can do - take deep breaths and get out of your own way. But it doesn't become a best-seller and you have to accept that. 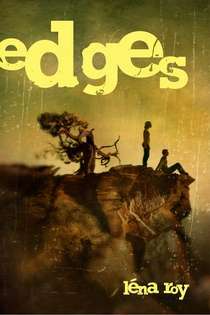 Being published by FSG, you, your agent and your editor were hopeful that Edges would be an award-driven book - but it did not get on anyone's radar. You are not John Green. Book #2 is loved, but ultimately rejected because the sales of book #1 are not high enough. You stop worrying about sales and focus on writing new stuff and teaching writing. Almost two years later, the rights revert back to you, and you buy out the Macmillan warehouse, so they can make room for shiny "new" things. That's okay with you - they weren't marketing you anyway. This is what happens, and it's not personal, it's business. And yes grasshopper, you go back to the work of writing, knowing that it's not about sales, but about communicating and finding the voice of the particular story. And that it's all about connecting you to the human race. And you love your day job just as much: empowering kids and teens to find their own voice through creative writing. Sing it, my friend! Sing the Blues. Because in the muck and dirt and piss and sweat of them Blues is a little thing called hope. congrats on the school pick up. so awesome. little book can and will. quietly maybe. here too. and that's good enough. Awesome news and beautiful post. You are an inspiration. Agreed. You indeed, inspire. Love you! Great to read this as my book releases March 1st--published by a MUCH smaller publisher . . . It's not about sales. Sales would be nice. But that's not what it's about. Life is good. This is a lesson I'm slowly, but surely learning. I will make a huge profit off my books one day, but my love of writing and sharing my world to the world fuels my passion and drive. By the way, is there a way I can read your novels? I can't find any links to Amazon or whatnot. Amazon or direct from me! Really informative and helpful post, keep sharing stuff like this.